The Ketogenic Diet: It Works… But I Still Don’t Recommend It (Here’s Why) « Burn The Fat Blog – Tom Venuto. Straight to the point: Keto diets do work. Unfortunately, there are more myths being spread about keto and LCHF diets than there are truths. Thats why I put together this frequently asked questions list, which is a collection of everything Burn the Fat Blog readers have been asking me about keto and low carb for the entire past year. Instead of answering one person’s particular question, in this post I answer them ALL. I won’t go into detail about ketosis biochemistry, ketogenic diet implementation (this is not a how-to), or the scientific literature on LCHF diets (though my post is evidence-based). But if you’re confused about this subject, or simply curious what all the hype is about, you’ll find my simple answers valuable. You’ll also learn why I still don’t recommend keto diets, at least not broadly as a starting point for most people. Along the way, we’ll bust a bunch of myths too. A good place to start is to point out that despite the apparent “sudden” rise of the ketogenic and other low carb, high fat (LCHF) diets, they are not new – they are old. LCHF diets have actually been promoted widely for weight loss in books and organized programs for at least 50 years. In fact the earliest low carb diet book on record goes back to 1863. In the modern era, the Atkins diet was one of the earliest mega-popular LCHF iterations, initially released in 1972, and then again later in 1997 in an updated edition (I read both). There were others around before Atkins, which didn’t achieve equal fame, and many variations on the theme after. LCHF diets have even been used by bodybuilders for fat loss at least since the 1960’s, though more bodybuilders use low carb diets that are high in protein, not high in fat (a keto low carb diet and a high protein low carb diet are not the same thing). On a personal note, in the 1990s, I tried LCHF diets three separate times, so I have personal experience – I don’t just read studies. On one occasion, I used a LCHF diet for an entire contest prep (No, I didn’t win that one, but I was ripped enough to be onstage). Despite having seen it work for myself as well as others, keto or LCHF diets have never become my long-term diet of choice or my recommendation to others as a first choice, no matter how many times they have spiked in popularity. Cutting carbs to almost zero and eating mostly fat is not the place I recommend that anyone start with lifestyle change (for me it was purely a short-term experiment). Reading this list of frequently asked questions will help you understand why. The Ketogenic Diet is a high fat, very low carb, moderate protein diet. Key point: keto is not a high protein diet, it is a high fat diet. Advocates of the ketogenic diet often claim they do it for health, but it is widely promoted for weight loss. It has also been promoted therapeutically to treat certain medical conditions, including epilepsy. Keto, other types of LCHF diets, as well as high-protein, low-carb diets, have also been used in competitive bodybuilding since at least the 1960s. Famed bodybuilding trainer Vince Gironda was one of the early advocates, and that is how I originally heard about the LCHF diet. In bodybuilding, cutting carbs is sometimes used as a pre-contest diet strategy. It is rarely used for muscle gain, as bodybuilders typically increase the carb calories substantially during the muscle mass-building season. Some types of LCHF diets are so extremely low in carbs (as low as 20 grams or 5% of total calories), they cause the production of ketones in the blood, which can be used by the brain as an alternate fuel source in lieu of sufficient glucose. These are known as ketogenic low carb diets. In the absence of carbohydrates, the body relies more on fat for energy. Yes. In controlled research, ketogenic diets work for weight loss, as long as the subjects are able to follow the program. The same is true for many other diets. But diets that are restrictive (as in cutting out an entire food group or macronutrient) raise concerns about reduced long term adherence. All diets that produce a calorie deficit can result in weight loss. A bigger question is which diet can you stick to as a lifestyle? Does it work better than higher carb diets? No. In well-done scientific studies, the amount of carbs or fat did not make a difference either way if calories and protein were controlled and matched. It’s not the carb amount per se, it’s the calories that makes the difference. Higher protein diets may offer weight loss advantages, but a high protein diet and a low carb diet are not necessarily the same thing. In some cases, improved fat loss is actually due to eating more protein, which is more thermogenic and suppresses appetite more than carbs or fat. Do keto diets work long term? Let’s be honest. No diets have a good long term track record. Long term weight loss and maintenance is hard and requires lifestyle change. There’s no magic in any one particular diet. But you do make it harder on yourself if you choose a plan that forbids you to eat foods you enjoy. However, in the research, though long term success rates are low, the LCHF diets are at least as effective as other traditional diets. There have been some studies showing better weight loss in the short term with LCHF diets, but it usually equaled out over time (much of the initial quick weight loss is water and glycogen). Keto and LCHF diets can work long term, but not any better than other diets, and many individuals have a hard time with complying to the extreme carb restriction. Why do people think keto diets work? Most advocates of the ketogenic diet believe in and promote the carbohydrate/insulin hypothesis of obesity. This states that carbohydrates produce insulin and insulin promotes fat storage and or prevents fat loss. Therefore, LCHF and keto diets have resulted in a widespread fear of carbs (“carbophobia”), a belief that carbs are fattening and a belief that fat loss depends on hormone control not calorie control. This insulin theory has never been scientifically validated – in fact, it has been recently refuted. Fat gain is caused by an energy surplus. Carbohydrates are not inherently fattening (absent a calorie surplus) and insulin is not the cause of fat gain or obesity. 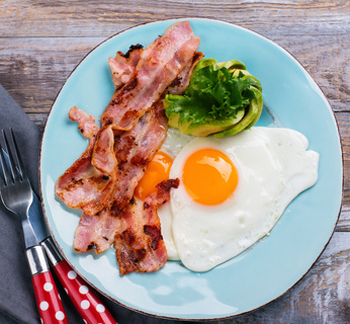 Why does a ketogenic diet really work? There is evidence that ketogenic and LCHF diets can suppress appetite and help some people automatically reduce caloric intake. If this is true, that’s a legitimate benefit, at least if hunger has been a problem for a particular dieter. Some keto / LCHF diets do not require or encourage calorie counting, only the restriction of carbs to a certain number of grams (often 20g per day). That instruction to reduce carbs makes the diet potentially very simple as well, which many people also consider a reason it works. (A diet that’s too complicated can reduce adherence). Keto diets also completely eliminate an entire macronutrient – carbs – a huge group of foods that includes calorie dense sugars, starches and grains, which are very easy to overeat when they are not controlled (especially highly refined and processed sugars and starches which can be hyper-palatable). This should be one of the most obvious reasons the diet works (restriction of calorie-dense, highly-palatable foods and drinks). Ironically, many fans of keto diets don’t acknowledge this simple reason because they believe there is some kind of “hormonal magic” going on. Closer to the truth is, the diet simply makes it difficult to overeat and a calorie deficit can be easily achieved if the strict rules can be followed. Is the ketogenic diet the best diet for weight loss? Absolutely not. Despite insistent claims of superiority by ketogenic diet advocates, the vast body of research shows that Ketogenic diets are as effective as other diets, if they can be adhered to, and if protein calories are matched, but keto is no more effective for weight loss than any other diet. Effectiveness in the long term also depends on whether an individual likes the diet and can stick with it as a lifestyle. With a minimal carb intake, keto is very restrictive. Some people find the richness of the high fat that’s allowed make it tolerable or even enjoyable, but for many others, the removal of carbs make it intolerable, not enjoyable and impossible to stay on for long, let alone adopt as a lifestyle. What about studies that show LCHF or keto diets are superior? Most studies showing LCHF diets worked better than high carb diets were short term. Results tend to even out in longer studies. Also, many favorable low-carb studies were not properly controlled. To make a fair comparison, the subjects must have their food intake controlled in a metabolic ward (researchers give them the food – subjects are not trusted to self-report calories accurately). In addition, the study design has to be set up so the only thing being tested is carbs versus fat. The calories and protein must be held constant or a proper comparison cannot be made. Therefore, the only studies which can be used to confirm or refute which diet is better must have been matched for calories and protein. In all the studies that match for calories and protein, most, if not all, supposed advantages of LCHF diets disappear. From a pure weight loss perspective, there’s no “metabolic advantage” to LCHF and keto diets – they are only a way to control calories. If anything, higher protein gives a (small) metabolic advantage (not low carbs). What about all the low carb success stories I hear about? There are testimonials and success stories for every diet. I think it’s great that people have open minds and are willing to experiment to try finding the best diet for their situation, and are enthusiastic about sharing what happened. But it’s important to remember that for every low carb, high fat diet anecdote, there’s a high carb, low fat anecdote as well. Personal testimonies are interesting and sometimes inspiring, but simply don’t carry much weight in any scientific argument about diet program effectiveness. In fact, the number of people who have been successful with both approaches demonstrate that there’s more than one way to lose weight, and that success at weight loss does not revolve around the amount of carbs in the diet, but on other factors including calories, protein and ultimately, adherence. Is it working? If so great, but do you like it, and can you stick with it? Have you lost the weight and then easily kept it off for an extended period of time? That’s a greater measure of real success. Are ketogenic diets just a fad or trend? How do we define fad diet? Sometimes fad and trend are used interchangeably but while the word fad implies popularity, it also carries a negative connotation (as in gimmicky) while trendy may not. A trend is simply referring to current popularity, like the google trends chart would reveal in the number of web searches, for example. Ketogenic diets are still trendy right now, but is that the same as being a fad? In my opinion it depends on how they’re explained and promoted. There’s an enormous amount of scientific literature on low carb versus high carb diets. It’s probably the single biggest debate in health and weight loss dieting of all time. There are decades of studies on this. Research shows that a variety of different diets can work for weight loss. Research says vegan diets work. Research says low carb diets work. Research says high carb diets work. Research says medium carb diets work. It’s not the macronutrient mix of the diet that matters most, its whether the program helps someone achieve a calorie deficit. Where ketogenic diets take on a fad-like quality is when they’re promoted as the best, or superior to other diets (which is not scientifically supported). Even worse is when they’re promoted with the claim that calories don’t matter, only hormones do (also not scientifically supported). What is the effect of Ketogenic diets on lean body mass? Some research suggests that more lean body mass (all lean body mass – water, glycogen and protein) is lost on ketogenic diets compared to other diets. However, adequate protein on LCHF diets combined with progressive resistance weight training will likely prevent most muscle loss. If a keto diet were followed with low protein and no weight training, I would be watching for muscle loss. Are keto diets ok for anaerobic / strength / physique athletes? Some strength or physique athletes seem to do okay on keto. But the weight of the scientific evidence suggests that keto is outperformed by more conventional diets that have more carbs. More research is needed in this area, especially on long term effects and the effect at maintenance or surplus calories. On that note, it’s worth considering that if a LCHF diet does heavily suppress appetite, that would be good for weight loss, but would actually make it difficult to achieve a surplus, and thereby make it a poor choice for muscle gaining programs. What about aerobic athletes and endurance athletes? Is keto okay for endurance athletes? Again keto seems to be outperformed by more conventional diets with higher carbs, but some endurance athletes seem to be able to “run on fat” okay, especially in longer, less intense events. There is also novel, but legitimate research going on right now regarding carbohydrate periodization and “training low while competing high” (in carbs). However, most endurance coaches don’t recommend keto or LCHF diets. Endurance athletes on keto appear to be the exception, not the rule. In fact, (anecdotally), I see far more endurance athletes doing the exact opposite – following plant-based diets than keto. Questions have been raised about the healthfulness of Keto or LCHF diets and they are still being debated and researched. When health benefits are achieved, an important question is, how much of these health benefits came from the foods eaten versus the benefits imparted by the weight that was lost? The big confounding factor is that health usually improves when weight is lost, regardless of which diet was used to lose the weight. Even if we sorted that out, it’s a difficult question to answer because so many variables affect health, including which specific foods are eaten, what types of fats are consumed, what kind of exercise is being done and what does the rest of a person’s lifestyle look like (sleep, stress, alcohol, smoking and so on). Genetics are also a huge factor.. This is probably one of the biggest controversies of all and this question is probably best answered by your own doctor in the form of having your blood work tested. I am not a doctor. I will say that paradoxically (given many people’s fear of dietary fat, especially saturated fat), I know people who monitored their bloodwork saw improvements in their blood lipid profile after losing weight on a keto diet. But I have also heard reports from doctors who have seen decrements in blood lipid profiles of their patients who added fats indiscriminately without careful consideration of the type of fat, the distribution of the different types of fat and the overall composition of the rest of the diet. Do you recommend keto or LCHF diets? I do NOT recommend keto or LCHF diets as a first choice or a “best” all around choice for weight loss. Jumping on the keto or LCHF bandwagon purely because it’s popular and there’s a lot of buzz around it could be a big mistake and a huge waste of time for most people, especially people who are active, relatively healthy and just looking to lose some fat. A balanced diet with high protein, lots of fruits and vegetables and without restriction of entire macros or food categories is my first recommendation for where most people should start. Thirty years of experience has taught me that restriction of entire food groups – or extreme restriction in any form – will ultimately backfire on more people than it will work for. Many people don’t accept this until after the weight loss is achieved and the bigger challenge of long term maintenance has begun. After starting out with a more balanced traditional diet, many people experiment intelligently and find they do better by reducing carbs. It’s simply important to consider the long term and not make judgements about your results too quickly. Quick weight loss is often seen on keto and other low carb diets due to water weight loss in the early days and weeks, and frankly, almost any diet will work in the short term. But for a handful of people who find the LCHF diet sustainable, who have dieting experience and health problems that make them suspect they fall into the carb intolerant category, LCHF diets may be a valid approach and a helpful tool. So you don’t hate ketogenic or LCHF diets? No, I don’t “hate” keto LCHF diets. They’re simply not what I recommend to the masses or to anyone as a first place to start with eating for better body composition. I especially don’t believe keto or very low carb diets are a best choice for most athletes or bodybuilders. Healthy, hard training athletes almost always have better glycemic control and can handle more carbs, not to mention they are lean to begin with, so unless they truly enjoy the lower carb, higher fat eating style, there seems little point in being so restrictive. I also don’t think the majority of people have to go “full keto” (very low carb and very high fat) to gain some of the possible benefits of low carb diets. I do believe that increasing protein and decreasing carbs somewhat has potential to help with fat loss. But I also think that simply swapping out a small percentage of carb calories (especially refined sugar and processed carbs) for protein and healthy fat alone could make a difference. Many people do well on moderate carb diets, but cutting to extremely low carb levels makes them feel worse, not better, and they don’t sustain it for long. I see the extremely low carb diet as a tool to use under certain circumstances for certain people who are fully educated on the subject and know exactly what they’re doing and why they’re doing it. The people doing keto or LCHF intelligently are not simply bandwagon hopping and repeating party lines – they have specific reasons they’re doing it. Keto and LCHF diets are also probably more appropriate for metabolically unhealthy, overweight or obese people who are sedentary or less active as well. What bugs me is seeing carbs being demonized, and I dislike and discourage the false narratives that are still being spread about why LCHF diets work. In addition to still clinging to the false insulin theory of obesity, and claiming “calories in, calories out is a myth” or chanting, “hormones, not calories,” even worse is when low carb advocates say things like, “Carbs make you fat” or “You can’t get lean on high carbs.” That’s utterly ridiculous and demonstrably false. Yes, I got ripped enough for competition on a LCHF diet once, but here’s another anecdote. I also got ripped on a diet that was 60% carbs, 30% protein and 10% fat… and that time I won). A recent study from the UK found that the top drug-free bodybuilders in the premier federation were eating 49.7% of their calories from carbs (source: Journal of the International Society of Sports Nutrition 15:4. 2018). While many bodybuilders drop carbs to 40% or even 30% of their calories, this goes to show that carbs can be customized and people get lean on a wide variety of carb intakes. Cutting carbs is not a requirement. No. I am not a keto or LCHF diet coach or expert, plus I can’t help with the monitoring of blood work and health markers. You need a doctor for that. However, for people who are intelligently using or experimenting with LCHF sensibly, I would not discourage them from keeping it up if they are finding it’s working and sustainable. They can find an expert coach if they need one. Almost everyone can benefit from a coach. I recently noticed that there are coaching companies today that will give you a keto diet, a paleo diet, a fasting diet, a vegan diet, a bodybuilding diet, a high carb low fat diet or anything in between. On one hand, I think it’s great that nutrition and fitness pros today are not taking a side and instead acknowledge that there are many ways to reach your fat loss goals and different approaches work for different people. I teach all my readers and clients to customize their calories, macros and food choices. But I have never jumped on the latest bandwagon simply to get more clients or sell a new book about the highest trending diet. I focus on fundamentals and principles. No matter what the latest trend is, I’ve been teaching the same effective method for years without changing my core message about how you get lasting results, which is essentially, “Personalized, balanced, sensible, and sustainable – no extremes.” My method is based on the bodybuilding and physique athlete style of eating, and it’s all explained in my book Burn the Fat, Feed the Muscle. Respectful debates and conversations about the evidence and even the sharing of personal experience however, are not only welcome, they are important to keep science – and the industry – moving in a positive direction. I think at this point, one of the best discussions to have is not about which diet is best – because a single best diet for everyone does not exist. Instead, more time should be spent talking about how we might decide which diet is best for each individual, given unique health challenges and personal preferences, and how to make diets more sustainable, for lasting results. Great article and very much appreciate what you do for this community. My wife and I have been on a keto diet since the first of the year, and it has worked great for us, but we I’m very analytical when going about such changes in lifestyle so I’m probably not typical. Year to date, I have lost roughly 70 pounds and I’m hovering in the 16% body fat range. I’ve tried eating like recommended on your website and tracked my meals for nearly six months… did good then too and lost 30+ pounds but couldn’t keep it up and gained it all back and them some. We both had full blood work ups before the diet and recently. Our Doctor’s are amazed at our weight loss and our blood panels, but do warn us about our cholesterol getting a little on the high side. Probably our fault the last blood test we fell in the habit of making too many high fat meals with cheese and cream… since we have adjusted. Personally I find the Keto-diet much easier to maintain and the cravings are completely non-existent. My goal is to remain on the diet till the end of the year, take another blood test, and re-evaluate my goals. I’m 5′-6″ maintain a body weight of 175 at 50 years young, train 3-times a week and measure my protein intake to keep my muscle mass but do feel I have loss a little more than 5 pounds of muscle so far this year. I think it was in the early stages of adjusting and when I hit a plateau that I went too light on the calories and protein. My endurance and wight lifting, however, have been steadily going upward for the last three to four months. I don’t lift anything heavy right now, as gaining muscle is not my goal. My routine is very simple… half hour of cardio followed with three sets of setups (various combinations of 40 at a time), pull-ups with super set of push-ups (25 at a time), with less than one minute rest followed by hanging leg raises with superset of dips. Occasionally I add in a super light squats or weighted lunges. Love the article and your advice on such matters. Hi Tom (great name by the way 🙂 ) … very sensible and well-thought-out approach. And congrats on the great results. Keep up that protein and pumping iron (the superset training is awesome isn’t it? I’ll be talking about that a lot in upcoming blog posts) Keep up the good work! Thanks for this article it was extremely helpful. I followed a diet for a while which wasn’t labelled but would be considered in the Keto field. Initial weight loss was good. But I found I needed to add moderate carbs back in as I was like a crazy person & felt my energy quite depleted. Obviously this is something quite individual for everyone. I found you have to eat A LOT of vegies to balance this out also & to feel full. Which I have tried to keep in but isn’t always practical. For me as a long term option it wasn’t for me but it did help me reset how I saw food, calories, and calorie management. Balance is always good but as you said the effective approach is the one that works for you long term and no matter what that is it requires persistence & wisdom & dedication. Loved the article. Thanks again for your wisdom & balance. Hi Jane! When I do “low carb” these days, its more “moderate” than low as well. (with high protein). Absolutely individual for everyone, though. Thanks for your post. Tom thanks for the informative and thoughtful article. There’s no advantage for weight loss on a keto diet when calories are matched, soooo much science proves this. But food has a long journey before it can transfer energy through calories. Carbs seem to be the x-factor macro that can really cause problems in SOME people. Those problems can be profound and go away when carbs are greatly restricted, again in SOME people. It’s not so much a weight loss thing but the negative individual physiologic response to sugar that is so fascinating to me. Hi Vance. I would agree with that. Its not a stretch to say we should be able to describe SOME individuals as “carb intolerant” (even carbs that are generally considered healthy) On the surface it seems we have a fair idea of who might be such a candidate, but based on recent studies like DIETFITS (https://jamanetwork.com/journals/jama/fullarticle/2673150) predicting that in advance appears more complicated – these researchers could not connect insulin action (resistance) or genotype pattern to who would do better on low carb. This why I still suggest that to at least some degree, it may simply require experimentation. and i do want to try it, I am a lazy person and i have been going out of my way no to eat sugars and exercising early in the morning and the results are not what i expect…… i know this is probably a scam but i can’t help but wonder is there is at least some truth to it. I didnt look up the supplement, but my guess is that its probably “exogenous ketones.” Though I have noticed the whole supplement industry has started slapping the word “keto” on entire lines of products to take advantage of the hype. As far as I know, there is not much research evidence supporting any keto supplements including exogenous ketones, but to do the subject justice Id have to actually look up the research papers and write a proper post on it. As i mentioned in the article, if someone wants to do keto and knows why and knows what they are doing, its certainly a viable option, but buyer beware when it comes to supplements.